The fire began on one boat and quickly spread to at least two others. 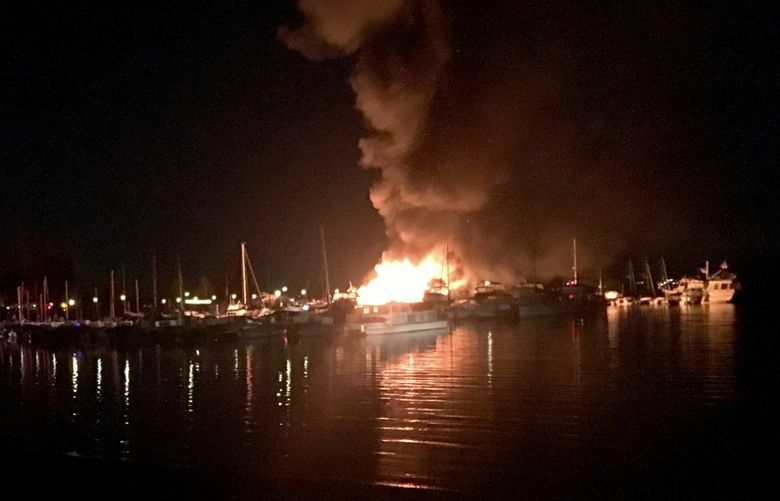 Three boats burned and a man was taken to Harborview Medical Center with minor injuries after a fire broke out Sunday night on the north side of Lakewood Moorage, located in the 4400 block of Lake Washington Boulevard South, according to the Seattle Fire Department. The fire broke out on a pleasure boat around 9:15 p.m., quickly spread to two other boats, and threatened another as firefighters raced to stretch hoses to extinguish the flames. The boats were cut loose, then re-secured as firefighters brought the blaze under control around 10 p.m.
A 59-year-old man was taken by ambulance with minor injuries.